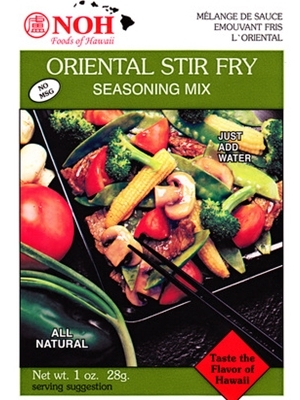 NOH Oriental Stir Fry Seasoning Mix taste the flavor or Hawaii. Your choice of vegetables: broccoli, round onions, green onions, celery, mushrooms, Chinese peas, baby corns, zucchinis, carrots, etc. Combine contents of package with 1/2 cup water; blend well. Slice meat (beef, chicken, pork) into thin bite-size pieces. Marinate meat in sauce for at least 5 minutes. Heat wok or skillet and add cooking oil. Stir fry meat for 1 minute; par cook. Add vegetables and stir fry for 2-3 minutes. Add marinating sauce and continue to stir fry until sauce thickens (when cooked, vegetables should remain slightly firm). Serve NOH Stir Fry dish over rice. Cornstarch, natural cane sugar, powdered soy sauce (wheat, soybeans, salt, maltodextrin), non-fat dry milk, salt, garlic powder, onion powder, spices.